Too Many Tears gives a sad but clear account of the loss of identity felt by a half-caste infant removed by Native Welfare from her desert tribe to a mission farm only to have her own children removed by Child Welfare a generation later. Essential ammunition for all who are sincerely Sorry! Beyond the legal deposit required to the National Library and major state libraries, we have been seeing an increasing trickle of orders from library suppliers, leading to Library Suppliers keeping a quantity in stock ready for shipment to their clients. 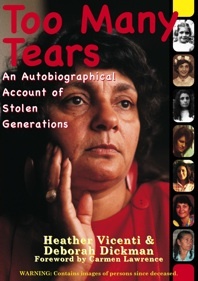 Fairfax’s suburban reporter Ozlem Ozturk interviewed Heather at and after the Melbourne launch of Too Many Tears. Oz’s report appeared in The Advocate datelined 8th July 2008 and other Fairfax suburban papers, under the headline “Tale of stolen lives sheds light on a dark chapter”. Complementing the natural focus of the Fremantle launch on Heather’s local community, the Melbourne function at Melbourne’s Living Museum of the West, Pipemakers Park, Van Ness Avenue, Maribyrnong, addressed the importance of such stories in providing wider education about the real experiences of the stolen generation. 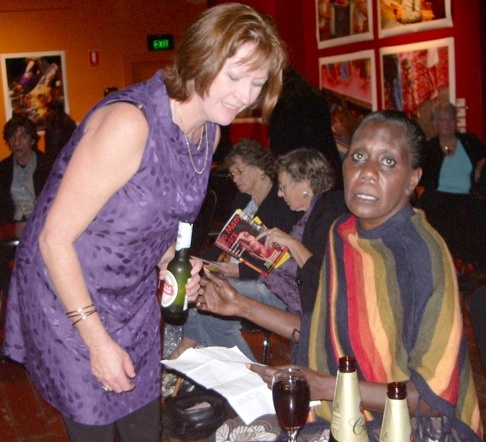 Co-authors Heather Vicenti and Deborah Dickman were both over from Perth and spoke with publisher Tony Smith about the book before state Member for Essendon Judy Maddigan formally launched Too Many Tears into the Eastern States, broadly defined as anywhere between Adelaide and Booroloola (we had visitors from both). Returning to the venue of the recent service of celebration of the life of Joan Carstairs, the launch provided an opportunity to reflect on Joan’s role in catalysing and maintaining focus on the publication of the book during her final months. We again showed a short clip from A Little Life of Joan talking about Heather 20 years ago. Conversation Hour producer Pete Dillon may have exceeded even his usual high standard in lining up Muriel Bamblett as co-host and Chris Spindler as the second guest. Muriel is not just CEO of the Victorian Aboriginal Child Care Agency but also discovered on reading Too Many Tears that she has family connections to Ricci’s partner Annita. After Heather, Chris Spindler spoke about his father Senator Sid’s legacy in the Towards a Just Society Fund which helps young aboriginals at crucial stages of their education and we discovered that Sid’s response as a post war emigrant from Poland to the plight of aboriginals closely mirrored the report by Koori Mail’s Ken Boase of the support a young Heather had found in Perth from the Polish community. Ken Boase’s substantial report of the Fremantle launch of Too Many Tears appeared in the Koori Mail for the fortnight beginning 4th June 2008, under the headline “Book tells of mission life”. Ken reported remarks made by Charlie Kickett in his welcome to country and by Carmen Lawrence in launching the book as well as his interview with Heather after the launch. As listed separately, additional quality resellers are now stocking Too Many Tears in Adelaide, Fremantle and Melbourne. Arguably Australia’s most influential bookstore, Gleebooks, now has Too Many Tears in stock for retail sales. True Blue Gallery, 84-86 High Street, Fremantle (the west end) was the first place to have Too Many Tears in stock for retail sales. Too Many Tears was launched by Dr Carmen Lawrence on Thursday, 15th May 2008, at KULCHA in the heart of Fremantle in front of 200 people, many of whom kept Heather signing their copies until long into the evening. At the conclusion of the launch proceedings, Lois Olney treated us to three beautiful songs dedicated to “Auntie Heather”. Special thanks to Ron Gidgup for keeping it all flowing as Master of Ceremonies, to Charlie Kickett for his welcome to Nyungar land, to the catering team led by Sherryl Coffey and co-author Deborah, and to Cockburn Council for their support. Organiser Sherryl with singer Lois at the launch. We will feature more of the extensive photos and video from the night here when time permits. On Tuesday, 13th May, in the lead up to the launch of Too Many Tears, Heather, granddaughter Jade and publisher Tony were able to enjoy a couple of hours at the old mission that had been Heather’s home from six to sixteen. 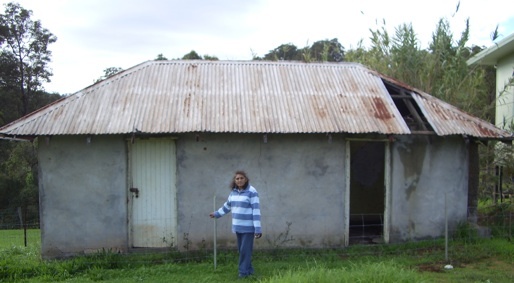 The still stunningly beautiful site is now owned and operated as a farm by the Indigenous Land Corporation in trust for Wookabunning Kiaka Association (see p. 192). The visit gave Heather an opportunity to sign and donate a copy of her book to the Roelands Mission children and to be updated on emerging conflicts between operating the farm according to globalised economic theory and respectful preservation of the site’s difficult history. Joan Smith had vital roles both in the story and in the publishing of Too Many Tears. Joan died suddenly but peacefully at 83 on April 17th knowing that her dear friend Heather Vicenti’s book had been printed but the day before the advance copies arrived in Melbourne and Perth. Heather spoke at the celebration service for Joan’s life at Melbourne’s Living Museum of the West, Pipemakers Park, Maribyrnong, staying on with Joan’s son and sister for a short break and some advance promotion of her book. Parts of this website are still delayed as a consequence.